Organising a school football festival involving the entire school involving children in the design of the tournament as well as running and organising the day. I wanted to do something to promote National Children’s Football Week and thought using a rural school would create a greater scope for children who may not be exposed to child-led events. Children are used to attending and participating in adult-directed activities but very rarely are given the opportunity to plan and run events of their own. I wanted to promote independence and responsibility within the older children as well as creating an environment which allows the younger children to play and enjoy being in a team without adult interference or tangible rewards. To allow children to experience different roles in football and possibly open pathways to opportunities they may choose to follow. I had discussions with the Senior Leadership Team within the school to make sure this event could take place and how best to involve the children. Then I had to promote my ideas to the staff and children and encourage the children to take the responsibility of running the event. To maintain community cohesion we hired the use of the local facilities. There were liaison with the FA Skills team in Kent to borrow all the goals and balls for the event. The festival went very well. We had over 150 participants who were coached, refereed and organised by 60 key stage 2 children. 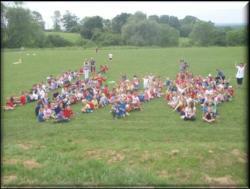 To coincide with the Queens Diamond Jubilee weekend we asked the children to dress in red, white or blue. This allowed the school to be part of two national events as well as a community one. The younger children enjoyed being coached by the older children and had lots of fun playing games between the football. It gave a sense of unity within the school in a relaxed environment. The aims were met and the festival received positive feedback. Initially the older children were nervous about it being their event but they were very successful and the younger children have asked for it to be run again. The Senior Leadership Team were positive in all their comments and are already looking at ways we can incorporate it for next year. A press release has been sent to the local paper as well as being sent out in the school newsletter. I have learnt that if you plant enough belief in children they will reward you with something much bigger and better then you could have ever planned. They layout and design of the festival was very simple and this allowed for the staff to enjoy supporting the children as well as allowing the children to be successful as their overall target was to have fun. It has aided a stronger community link as well as incorporating bigger companies such as the FA which the children are aware of. The older children are now able to appreciate the work that is involved for activities and events they do as well as being confident in the fact that they can organise a fun free festival for themselves. I would possibly look to advertise the event on a larger scale and try and get the local media down to write a report on it. Next time possibly invite parents to attend a tea party afterwards so they can appreciate the children’s effort whilst still not being an influence on their event. Have the passion and desire for the children to succeed and have fun aided me in making this festival work.